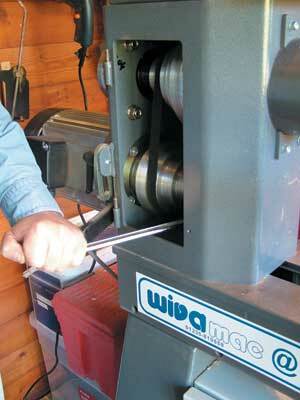 From the very first time I used a WivaMac, some years ago, I thought they were nicely made, no-nonsense lathes. I have had the opportunity to use them on many occasions since and have had no reason to alter my initial view of them; I like them - a lot. They are not the most attractive of lathes to look at, but that's not high up on my priority list. How they perform the function they were designed and built for is far more important and, in my view, they do this extremely well. I was aware that WivaMac has brought out a new model designed for the bowl turner and, when Peter Hemsley of The ToolPost asked if I wanted to put it through its paces, I jumped at the chance. One problem remained in that the only lathe available in the timescale of this publication had already been sold. I am extremely grateful to John Redington, the purchaser, who allowed me access to his workshop and new lathe in order to conduct this review. The DB6000 is based on the WivaMac DB1200. The head- and tailstock castings are the same. Five pulleys, together with infinitely variable speed through a Hitachi control box give this lathe a speed range of 90-3000rpm. The electronics for this lathe are housed in a box mounted underneath the lathe. Some of you may not like this positioning and, if this is the case, it can be easily moved and even hung on a wall if desired. There are detailed instructions on how to re-program the electronics should you wish to change the settings from the manufacturer's defaults, but I found these perfectly acceptable. I would have to use a lathe in production mode for a week or so before I really understood its foibles. The head- and tailstock are machined to accept 2MT accessories and the spindle thread on the headstock is M33 x 3.5. The capacity over the bed is 520mm. The headstock rotates and slides along the bed bars, enabling you to turn off the end of the lathe is you wish. 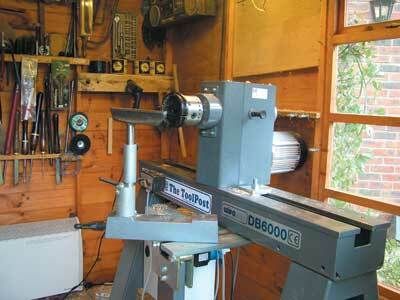 Another great feature of this lathe - and, I believe, of other lathes in WivaMac's range - is the toolrest banjo. This features a circular mounting plate with an offset hole which holds the toolrest. The whole mounting plate can rotate about a bolt which is also offset. This movement allows the front of the toolrest to protrude beyond the front face of the banjo, enabling the toolrest to be located closer to the workpiece without the workpiece fouling on the banjo. 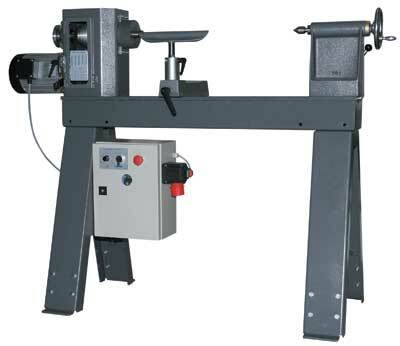 The lathe is mounted on a substantial A-Frame stand that provides great stability. This can be bolted to the floor as required. I liked the fact that provision is made within the stand to adjust the height by up to 50mm. The lathe bed is fabricated from heavy-section steel plate and is cross braced to give great rigidity. The top surfaces of the bed are made from 15mm-thick steel and are nicely machined to allow the toolrest assembly, head- and tailstocks to slide smoothly along them. The lathe I used had the optional extra of a remote control box - essentially the start/stop switch and the variable-speed dial in a box attached by a cable to the main control box. The box has a powerful magnet on the back and can therefore be moved and located anywhere about the lathe. The DB6000 is shorter than the DB1200, allowing 600mm to be turned between centres. Standard on this lathe is a 2hp motor with an optional upgrade to 3hp. In use it was difficult to fault this lathe. 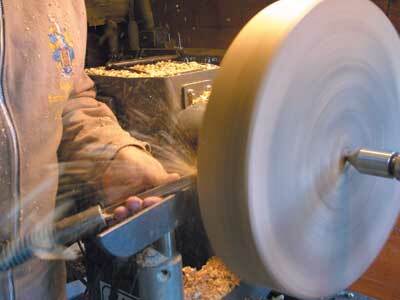 I mounted a very out-of-balance 430mm-diameter piece of chestnut first and set the speed to about 370rpm. I say 'about' because the digital readout displays the frequency or motor speed rather than the rpm of the spindle. There is a table on the headstock which converts some frequencies into spindle rpm and a graph in the handbook from which you can read off the intermittent frequencies. If the spindle rpm is important to you, this might be a little niggle, but you can always photocopy the graph and hang it on a wall. At this speed there was no vibration. As I brought the bowl blank more into balance, I increased the speed. I tried hard to slow the lathe down by taking very heavy cuts with the wing of my fingernail-profiled bowl gouge. I did manage to get the belt to slip, but having tightened this a little, found that I could be as aggressive as I liked without troubling the lathe at all. I also used the lathe to hollow a part-turned vase in black walnut. This time I rotated the headstock so that I did not need to lean over the bed to perform the hollowing. Again the lathe performed admirably. If the inboard capacity of this lathe is not sufficient for your requirements, an optional extra is the bowl turning attachment. This is also available for the DB1000 and DB1200. This is a substantial accessory which is attached to the underside of the lathe bed and therefore increases the bowl turning capacity considerably. The attachment has an adjustable leg which rests on the floor so that forces are channelled through the leg and not back to the lathe bed. The toolrest banjo is used on the attachment's auxiliary bed and a toolrest extension is provided to bring it up to the correct height. This bowl turning attachment can be slid under the lathe bed when not in use. 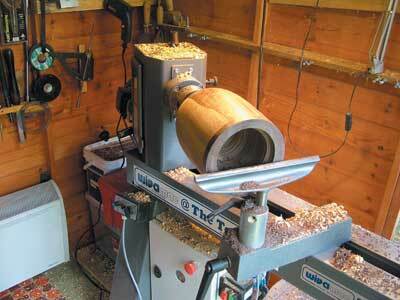 If I had to criticise the lathe at all it would be in a couple of small areas. Firstly I would find it annoying to have to completely remove a small bolt which 'locks' the pulley access door in the headstock. I know that Health and Safety regulations require a separate tool to be used to open doors which house moving parts, but I would still like to see a better way of opening this door than the complete removal of a bolt. Secondly, a spanner is required to loosen the nut inside the headstock in order to rotate it or move it along the bed. It is a little awkward and the pulley door needs to be removed to allow better access. The door is simply lifted off its hinges so it's not a big deal, but I would have preferred to move a lever, perhaps underneath the headstock, rather than have to use a spanner inside the pulley housing. These are two minor gripes about a lathe that in my opinion is superb. 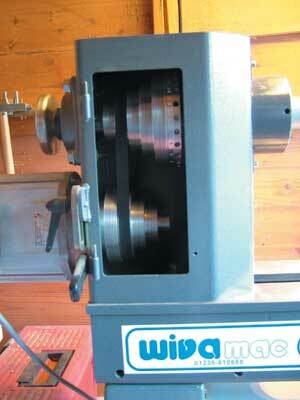 Being familiar with Wivamac lathes, I probably knew that I would like this one before I even saw it. I was not disappointed. "Being familiar with Wivamac lathes, I probably knew that I would like this one before I even saw it"